Perar has specialised in Low Temperature and Cryogenic service to the extreme temperature of minus 196 Deg C, in accordance to the most stringent specifications. 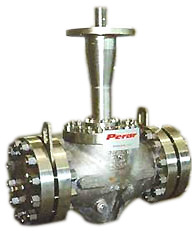 Perar Ball Valves in cryogenic service are supplied with extended bonnet with a sufficient gas column length (vapour space) to keep the stem seals exposed only to vapour and not the cold liquid to ensure functional integrity. Suitable seals are selected considering the customer’s process indication. PTFE lip seal spring energised or KEL-F are commonly used. Low Temperature Carbon Steel, Stainless Steel.